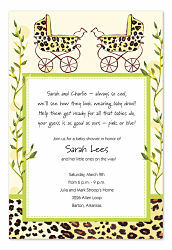 First impressions are everything, and for a baby shower, that means the invitation. 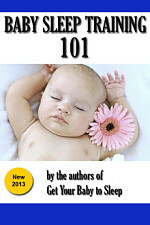 Twin baby showers offer the unique chance to do something special. The invitation offers the first hint of that. 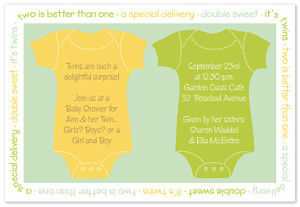 There are some cute ones out there for twin showers! 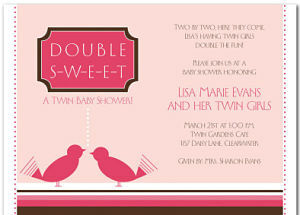 We picked nine of our favorite twin shower invitations to feature here. 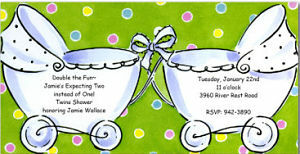 These shower invitations are tall (as opposed to wide) but there quite adorable. 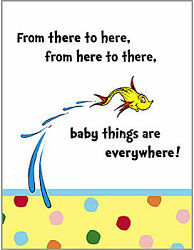 The Baby Seuss invitation is generic (and could apply to twins or to single babies), but if you have a Dr. Seuss theme it’s ideal. The Baby Cheetah stroller invitation was just my favorite in appearance, and the one on the right (baby bottles) has pink and blue for girl/boy twins. 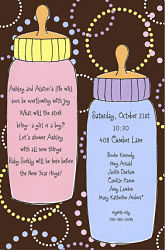 For a boy-girl twin shower (or a coed baby shower), the pink and blue bottle makes a good first impression. 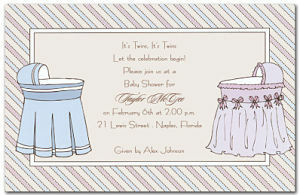 The wide baby shower invitation seems to be more popular for twin showers, and that’s probably because they depict pairs of items side-by-side… my favorites below feature bassinets, baby buggies, double tweetie birds, or twin onesies. All four of these can be customized! 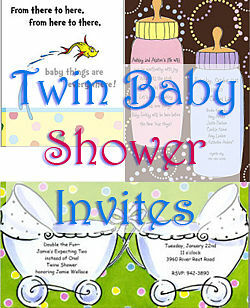 These cute twin shower invitations have bright colors that work for any expectation: twin boys, twin girls, or boy-girl twins. 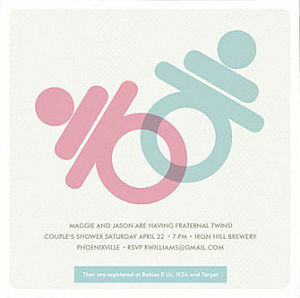 Last but not least are these customizable square invitations from Minted.com. You don’t see as many square invitations these days (probably due to the extra postage) so they really stand out. For both of these there are multiple color choices; I chose to show the boy/girl twin themed one. I get hungry just looking at this invitation, which reads “Double the cake, double the fun”. 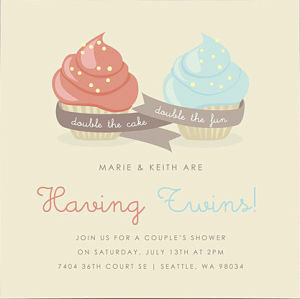 This customizable invite also works great for couples showers.